While it may feel good to conquer something urgent, you probably aren't getting anywhere by succumbing to "pinball syndrome." The truth is that, with practically every worthwhile job or career, we can all get caught up in the "pinball syndrome." Think of a pinball machine as a metaphor for all the urgent things that demand our attention throughout the day. And while we may not feel like we're playing a game, per se, when accomplishing such tasks, we might feel attracted to (or even seduced by) the rapid pace and focus that's required to get them done. Add a small endorphin rush as we check off the next item on our to-do list, and it's easy to see how the urgent can feel gratifying, even addictive at times. The challenge is that some of the urgencies might also be important, but the allure of the game gives everything equal weight. As a result, we can end up spending time and energy on the less important. In the words of author J.K. Rowling's Albus Dumbledore, "Humans have a knack for choosing precisely the things that are worst for them." Urgent things act on us; they compete for our attention and insist on a response. Consider the horrific example of Eastern Air Lines Flight 401, bound from New York to Miami on Dec. 29, 1972. The jumbo jet had a full load of holiday passengers as it began its final descent toward the Miami International Airport. When the crew pulled the handle to lower the landing gear, one of the lights failed to turn green. In this case, the nose-gear light had remained off, meaning that either the nose wheel hadn't safely come down and locked into place, or that the bulb itself had burned out. The pilot radioed the control tower: "Well, ah, tower, this is Eastern 401. It looks like we're gonna have to circle; we don't have a light on our nose gear yet." The tower directed the plane to change its approach and climb back to two thousand feet. They set the autopilot to a looping race-track pattern and turned their attention to the light. The captain and the first officer attempted to replace the bulb, but discovered that the cover had jammed. After working unsuccessfully to get it out, the engineer joined in, but likewise couldn't get the light to budge. The copilot suggested they use a handkerchief to get a better grip, but whatever they ended up trying didn't help. The engineer finally suggested pliers, but warned that if they forced it, they could end up breaking the mechanism. The crew kept at it, throwing out expletives as they struggled to get the light bulb out and replaced with another. The cockpit voice recorder captured the second officer next, "We did something to the altitude." "What?" the captain replied, confused. "We're still at two thousand feet, right?" the copilot asked. The captain then uttered his last words: "Hey, what's happening here?" The microphone captured the sounds of the airliner flying itself into the Everglades, taking the lives of 101 passengers and crew. The final report cited pilot error as the cause of the crash, stating that "the failure of the flight crew to monitor the flight instruments during the final four minutes of flight, and to detect an unexpected descent soon enough to prevent impact with the ground. Preoccupation with a malfunction ... distracted the crew's attention from the instruments and allowed the descent to go unnoticed." While this example is extreme, solving the problem of the landing gear light was certainly urgent. Landing the airplane safely, however, was of paramount importance. Unfortunately, in their zeal to address the urgent, the crew got distracted and unintentionally lost sight of what mattered most. In the workplace, urgencies tend to be easy to identify, like picking up the phone, answering a text or clicking an email. But, as the example of Flight 401 illustrates, the tendency to confuse what's urgent with what's important can have long-standing consequences. Like the next ball being served up to us by the pinball machine, it's a constant press of urgencies that act on us: They vie for our immediate intention. By contrast, important things often require us to act on them. Important things are those that contribute to our values and align to our highest goals. They are intentional and long-term rather than ad hoc and transitory. In almost all cases, they include important relationships. The nature of the pinball syndrome is to confuse urgency with importance. And since organizations often reward urgent behaviors (because by their very nature they're easy to recognize), work can provide a powerful incentive to pull the plunger back and play round after round. Of course, urgencies will come up that require our attention. Many things are both urgent and important. When I talk about avoiding the pinball syndrome, I'm not advocating that we step away from the game altogether, but rather, that we differentiate between when we must play and when we choose to play. The pinball game is rigged and, in the end, will eventually have its way. Despite whatever totals we've racked up on the scoreboard, or the long hours we've devoted over nights and weekends, the ball eventually slips through. Any win is temporary at best, and we're only given a small respite before the score resets and the next ball ratchets into place. It's what we do in that moment -- between reaching for the plunger and taking our hands off and stepping back -- that will make all the difference. Reflect on what's important to you at the deepest and most meaningful levels. Be specific. This process is how a GPS works -- we need to identify a destination first to calculate which roads will get us there most directly. The more exact the address, the better the chance we'll arrive. Goals that matter are those that are typically centered on strengthening relationships, planning for the future, and personal improvement. Choose your weekly priorities carefully. Rather than just a to-do list, think about which activities will have the greatest impact on your relationships and the outcomes you care most about. Consider which actions would build trust, make work easier for people, help you be more patient in your dealings with others, or create value for your customers. Try thinking about your weekly calendar as rows of empty containers, each limited by a finite amount of space (i.e., time). People who suffer from the pinball syndrome kid themselves into believing they can fit everything in -- all the numerous small and urgent tasks along with the fewer, more valuable and important ones. We tend to focus on the quick wins first, shoving as many urgent tasks into our limited containers as we can. And although the containers are full, they're not often filled with meaningful accomplishments. But, here's the problem: Once these limited spaces fill up with urgencies, the important things naturally fall by the wayside. If we thoughtfully identify and schedule the most important things first (the priorities that require us to act on them rather than react to them), what falls by the wayside are the urgent, less important things. And because they're less important, we won't get derailed if they don't get done right away. 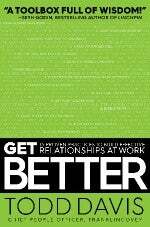 From GET BETTER: 15 Proven Practices to Build Effective Relationships at Work by Todd Davis. Copyright © 2017 by Franklin Covey Co. Reprinted by permission of Simon & Schuster, Inc.